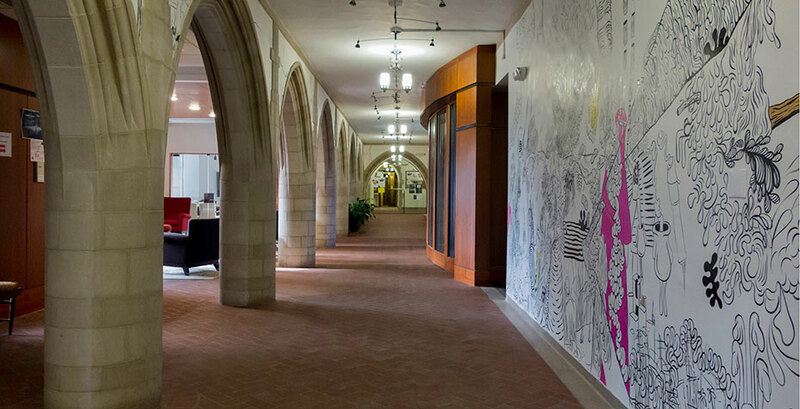 Explosions in the Sky, a mural by Assistant Professor of Art David Teng Olsen was created over the course of two weeks in the main corridor (both sides) of the Susan and Donald Newhouse Center for the Humanities, where Olsen is a Wellesley Faculty Fellow for the academic year. An exhaustive process, Olsen worked on it daily for two weeks—his self-imposed deadline. Fatigued at the end of it, he called the last mark he made on the wall “probably the worst mark I ever made,” but accepted the reflection of changed energy in the creative process as part of the story the mural tells. “Most often for me the magic of the mark happens during the moments I least expect it and I try for hours on end to recreate that exact moment that gave me shivers in the first place. There is no other time I am happier then when I am working on drawings,” Olsen wrote in his artist’s statement. An accomplished muralist, Olsen was recently recognized as an "Artist We Adore" by the art blog Baang + Burne Contemporary, which wrote: "David Teng Olsen blew us away initially with his large scale murals. Once we sat down with him for our Skype interview we were again blown away by his enthusiastic personality." The mural is a visual stream of consciousness, where one mark may lead to another but sometimes they would develop into figures or scenes that are easily recognizable by anyone who looks at imagery. Then Olsen would slip in something of his own, a stray hand or Seuss-like form to alter the horizon. Requests also came from passers-by; a faculty member’s child requested a giraffe, and Olsen obliged. A food delivery guy asked where the first mark occurred, and Olsen highlighted it. He also admits to being “obsessed by the news,” and spent time every day reading about what’s going on in the world. Thus Pope Emeritus Benedict pops up behind a shrub, and squiggly missiles make their way across the opposite wall. “It’s like a time capsule,” said Olsen. That said, how long will the mural remain? At least through Commencement, so that families and other visitors will have a chance to see it. Don’t dawdle—head to the Newhouse to check out Explosions in the Sky.